Advantages: Interesting and informative text; superb collection of period photographs; close-up images of various airframes; detailed scale plans in 1:72 and 1:48 scales; inspirational artwork. Conclusion: A superb publication that caters for both the enthusiast and modeller alike. 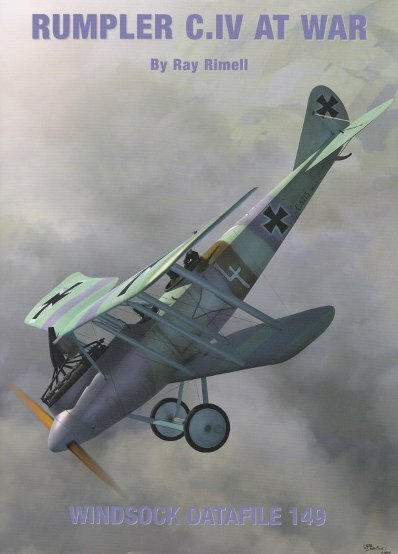 It was back in 1992 that the Rumpler C.IV first made its appearance in the Datafile series. The esteemed Peter Grosz authored the original monograph on this aircraft. Unfortunately it’s been out of print for some time but this updated study of the popular two-seater is a worthy successor. Ray Rimell provides the narrative and as expected, it’s an interesting and entertaining read. The history of these sleek and successful two-seaters is well covered along with the type’s operational service. A structural analysis follows and thanks to the Ministry of Munitions report of a captured example, there’s plenty of knowledge to pass on. One of the hallmarks of this series is the photographic coverage. This trend continues and naturally there is a wealth of new images that don’t appear in the earlier publication. Amongst the nearly 100 black and white period photographs are another 20+ close-up colour shots of the survivor in Munich. Mick Davis takes care of the scale plans and these are presented over 9 pages. As well as the expected 1:72 and 1:48 scale renditions, there are many internal details to educate the modeller. “Early” and “Late” variants are shown and a selection of contemporary sketches completes the illustrations. Ronny Bar supplies more of his inspiring artwork and provides the reader with a total of 7 brand-new aircraft profiles. This includes upper and lower views of one of the options and all subjects show an excellent variety of detail and livery. Rounding out the publication is a “Camouflage and Markings” section as well as an appendix that tabulates production figures, technical data, and past kits of the Rumpler C.IV. So once again this popular series delivers on providing the modeller and enthusiast with an excellent all-round coverage of an iconic WWI combatant. And with Wingnut Wings having announced a kit in 1:32 scale, it’s the perfect way to update ones reference material.